This plant is tough and easy to grow and thrives almost anywhere except soggy soils. 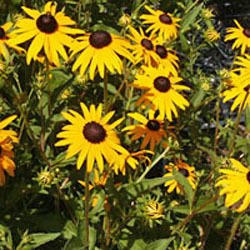 The large daisy-like flowers have yellow outer petals and dark centers. It blooms throughout the summer. Great for butterflies and as a fresh cut flower. Categories: All Items, all potted plants, butterfly nectar plants, fruits/seeds for birds, native American plants, Potted Plants, More..